At the Writing Studio and Bait Shop mist rose from patches of rich brown leaves and flowed across the Bay, hiding the Leelanau Peninsula. 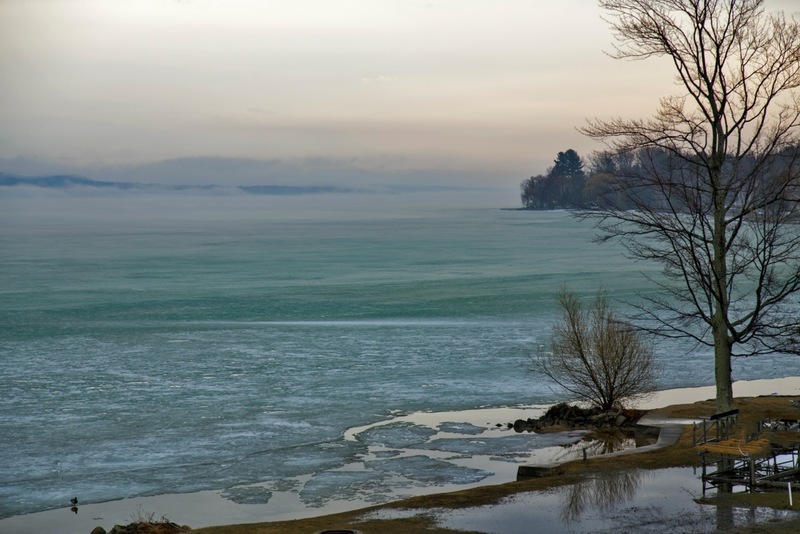 A mile to the east, Babs Young woke to blue Torch Lake, where the ice is melting at last. Colors are coming back into the world. “Leelanau” — what a neat sounding word. I love that color of blue green. Thank you. I am tempted to tell you that “Leelanau” is the Anishinaabek word for “little finger” but that would be teasing you. It was most likely made up by Henry Schoolcraft, who surveyed the north country in the 1840s and had more enthusiasm than skill for the languages of the people he met. Torch Lake is known for its many shades of blue. I love that color too. Bacardi rum used to come in a bottle that color, once upon a time. . . Yes. Blues and greens and aquamarines with a dash of violet. If I’d had a camera along for our walk yesterday I would have posted pictures of the electric green moss. It’s a great relief. That picture is so beautiful, I want to frame it and put it on the wall! Thank you for continually showing us the beauty of nature! Finally. I’m happy you are finally seeing some real progress towards Spring! We are beginning to feel better about the whole thing. So beautiful. And how nice that there’s just the faintest hint of apricot in that sunrise. Appropriate, no? I believe I’ll open a jar of Leelanau apricot preserves and taste your sunrise! You have a more discerning eye for color than I, but I can appreciate the apricot preserves, yes indeed. Oh, boy. Almost time for a swim! I thought I heard polar bears out there this morning, but it might have been Miss Sadie trying to wake me up. The world is definitely better in colour. Yes it is – unless, of course, a person is Ingrid Bergman or Lauren Bacall or Ansel Adams, which I am not. But I wish I were. Thanks for taking the time to write and photograph. We only get to our place up there every three weeks in the winter months, so it is nice to read and see what the lake\people are doing. What a Gem the state of Michigan has with Torch Lake. It is quite unique!!! You must be very careful. If you are reminded too often that you are missing something, you will want to be here all the time, and then your life will change. Change is good…as in white to color, winter to spring and such. Change is . . . inevitable, yes?